Everyone loves solar powered toys. These solar powered motion toys are tons of fun for your kids. Solar powered toys don't required batteries because they run on sunlight! Just place them near a window and watch them move all day. If you believe in solar energy, believe in this Innovative world’s first solar powered air plane Science Kit for Kids developed by ToyLabs. The Volta Flyer uses advanced solar technologies and ultralight materials to achieve flight powered by the Sun. The kit contains all of the prefabricated parts and components necessary to build your very own solar airplane. The Volta Flyer can be assembled in as little as 20 minutes without special tools or glues – just your hands. When building the Volta Flyer, kids will learn about basic mechanical engineering, aeronautics, electronics and renewable energy. The creator of Volta Flyer – Toylabs, started by developing the world’s first miniature polycrystalline silicon solar cell built on a flexible substrate to power our Volta Racer Solar Motorcar kits, and they are now launching the world’s first solar powered glider airplane kit for kids – the Volta Flyer. The solar “panel-on-wing assembly” technology and unique power management system enables the sun to power your flights – no batteries required. The Volta Flyer ships with a unique thin-film flexible amorphous silicon solar panel, a fuselage with wing receiver and embedded electronics, two sets of wings and vertical stabilizers, a set of wing joiners, and a set of cool decals to customize your Flyer. Detailed assembly instructions and a tutorial on aeronautics and the Volta Flyer’s electronic circuit design are included in the box and available online. The Volta Flyer is a revolutionary design using super-lightweight, eco-friendly materials to maximize flight time. Not found in any other airplane kit is a thin-film, flexible silicon solar panel and unique power management system that powers flights without the need for batteries - ever. This special design allows the Flyer to harness the sun’s energy for enhanced hang-time and incredible free-flight gliding. 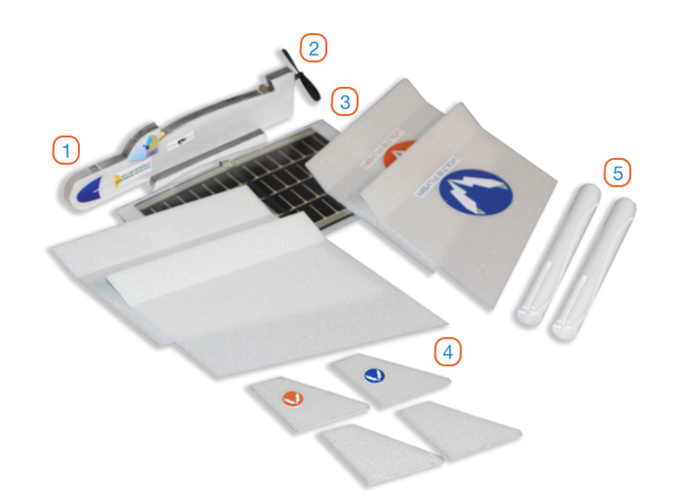 They have stretch goals in Kickstarter campaign and if it’s achieved, want to make an impact immediately by donating school classroom kits (7 each of Racer, Flyer, and Solar Panel) to a number of schools in underserved communities. They also have exciting plans to begin early development of the Flyer with onboard sensors to collect environmental data during flights. They see many possibilities for collecting, experimenting, interpreting and collaborating the results of this data in a classroom setting. A crowd funding campaign is underway for achieving a goal of $39,000 at Kickstarter. You can support and contribute to this Innovative project which is useful for your kids.